The slipover I've been making for my flatmate's birthday is done. I am holding it ransome till she seams the skirt she made me for my birthday, but the details can go up now. Pattern: Nice design, but badly written. It works - there are no actual mistakes, it’s simply hard to read. The instructions are clear enough, but badly structured. I'd like to know instructions in the order I'd need to apply them thank you. But a nice enough pattern. I modified it to do 1x1 rather than 2x2 ribbing. But that is just because I'm stupid and didn't read that bit of the pattern properly*. 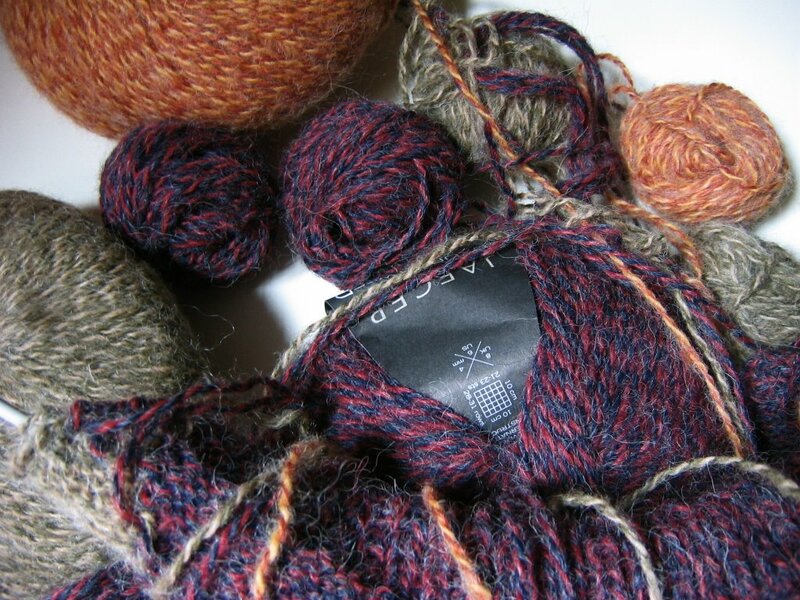 Yarn: Luxury Tweed. Mmmmm. Nice yarn. Nice colours. Needles: 3.75mm circular addis for the back. 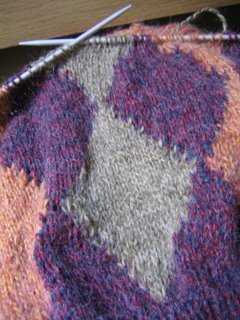 I swapped to straights for the intarsia. I hate working on long needles, I feel ungainly. They were an old pair of metal ones that used to belong to my mother, and ok (for straights). The only 3.25mm circular we had was bamboo. Bamboo is not the needle for this yarn, the friction was just stupid. Plus these are the sorts of bamboo circs that have the annoying little bobbles at the join between needle and wire. I actually quite enjoyed knitting this. 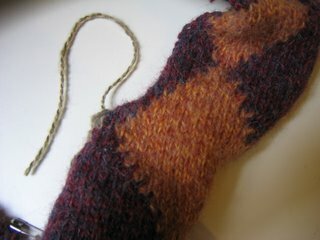 I learnt to knit backwards and had a play with continental knitting too. It was fun and I'm very pleased with the finished product which I think'll suit Kirsty lots. * Actually its because it said work "in rib" and I forgot to check which rib they meant. Would it hurt to say which rib when you are asking the knitter to start the ribbing, really? I know I have a below average short term memory (part of delights of being dyslexic) but well, pah gah blah blah blah (occasional failing of vocabulary also pleasure of dyslexia). Again I'm prefacing with a prettier-than-my-FO non-knitting photo. 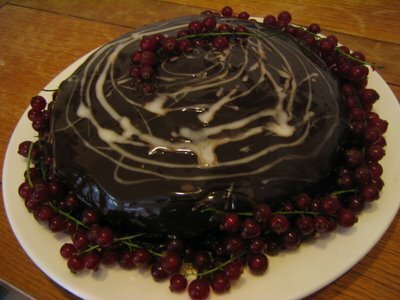 This is the cake I baked for my flatmate's birthday yesterday. 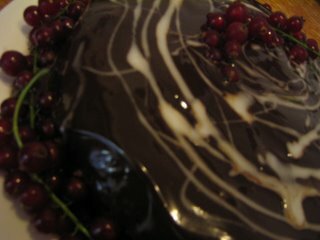 Based on this recipe, it took three bars of full-sized Green & Black's 70% chocolate and five eggs. The redcurrents were a last-minute thought, but they balance the richness beautifully. All very yum. 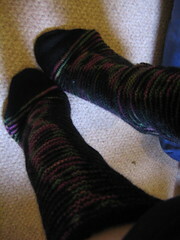 Back to the knitting - I have another sock FO. 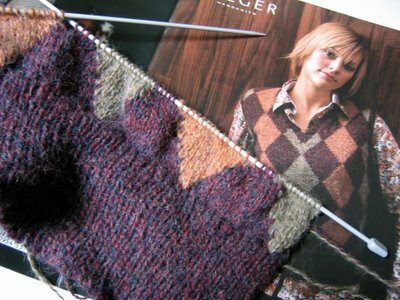 Pattern: based on Crusoe but toe up with a dutch (square) heel (instructions for toe-up dutch heel found here). I loved the stitch pattern, don't know what all this stuff about it lacking stretch is about (although this could be helped by the wonderful yarn, see below). Super-quick to knit with all those slipped stitches, and obviously it does what it is designed to do (i.e. show off variegated yarn). I'd not tried a dutch heel before, toe-up or cuff-down so this was an experiment. I think it was a bit too square for me, and the heel is very wide. But I will reserve judgment till after I've warn them longer than just taking photos of my feet. 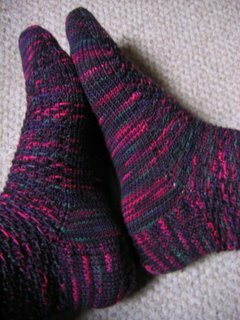 The heel was lots of fun to knit, even more than short-rows (and I LOVE short rows). I might play around with variations on this to see if I can make a toe-up dutch heel I like better. Yarn: Cherry Tree Hill Supersock in "Northern Lights". The colours are a bit dark to come out well on screen, but are lovely. Although I've no idea why they choose the name "Northern Lights" which I imagine as being much paler (I've never seen the northern lights so could well be talking poo). The bright neon pinks and greens with dark blues and purples made me think of 80s disco lights more than anything else. I didn't have any trouble with the dye coming off on my needles or hands, which I've heard from a few other Cherry Hill users. Other than colours, I once read this yarn described (along with STR & Koigu) simply as "a very nice merino". I think that says it all. It is warm and soft and squishy, which matches the thickness of the stranded pattern well. These are going to be very cozy socks. I'll finish with a close up of the cake. I'm off to eat some more of it. This photo has nothing to do with knitting. 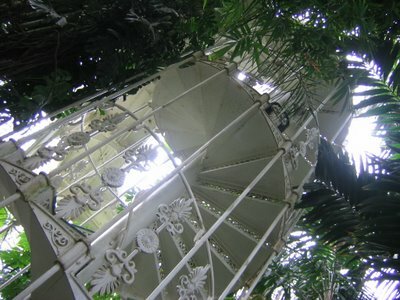 It is a spiral staircase at Kew Gardens where I spent this afternoon. It's just prettier than my FO which is illusion-knit so doesn't photograph well. Anyway, knitting. DNA illusion socks. Done. 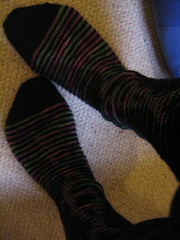 I used leftover yarn from Bakerloo, the illusion-sock idea from Lovemeknot and the dna chart from Rosalind. I'm calling them Dr Moreau. They are for a science teacher friend of mine who goes under the name of Dippy. A very late birthday present. They were late partly because it took me a month or so after his birthday to actually cast on (ahem), but also because Dippy has HUGE feet (hence bagginess in the shots above, those are my feet - and yes, in case Dippy is reading, I did take the photos before I washed them). At least I think he has big feet. I measured them properly but I decided to knit him socks at our joint birthday party last April, and by the time I got the measuring tape out we'd both had a drink or two. So I hope they fit. Next project? To continue with the mixing it up theme, I thought I'd try Crusoe, but toe-up with a dutch heel. Doesn't it look lovely and fluffy? I normally don't like fluffy but this yarn has just enough wool (65% merino, 35% alpaca) to keep it all in line, so the alpaca just gives it this lovely lightweight warmth. I have a load of it in a lavender colour waiting to turned into a cabled jumper for me. In response to my last post,Ysolda suggested I try knitting backwards. Of course! I'd been wanting to try that after I saw the article in the last knitty*, and it works a treat. I started off twisting stitches, but it wasn't long before I got the hang of it. A bit slower than purling, but you save the time of turning (and so reversing the arrangement of all the bobbins). I was worried it would mess up my gage but it doesn't seem to have made much difference. 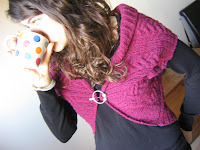 Kerrie's posted up a sneak peak of my design on the yarn foward site. It's the knit side, which luckily prompted me to check I'd made it clear the pattern is reverse st st. This is the problem with purl-side as right-side, it can give the impression of being inside out. I have a big grey cardigan my boyfriend is always telling me I've got on the wrong way round. 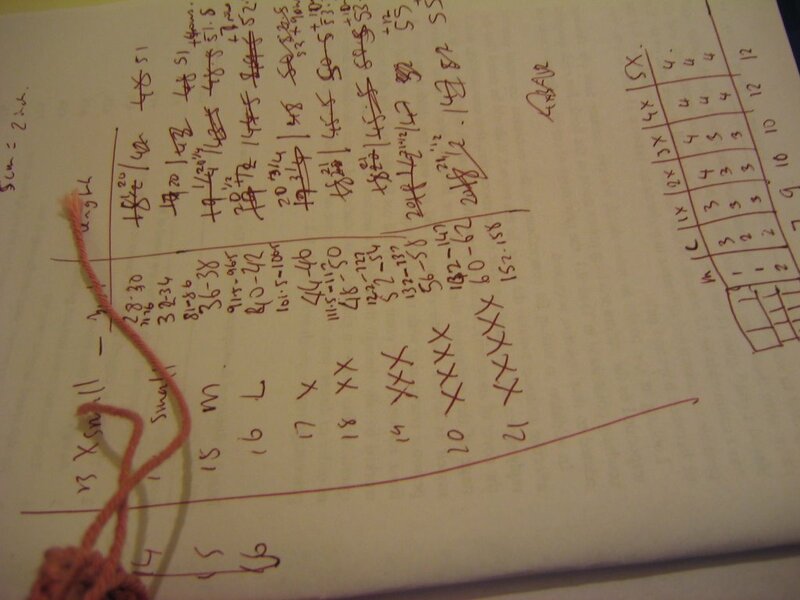 * I've sometimes heard knitters say "knitty articles, oh I never read them, its all about the patterns". These people are fools. 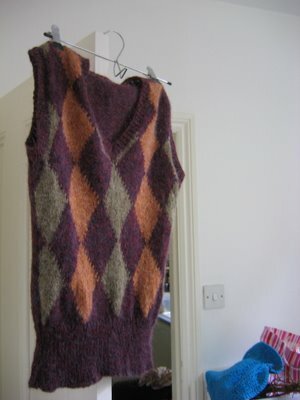 I've have been working on this luxury tweed slipover for a bit. It's going to be a birthday present for my flatmate (who taught me to knit - so it has to be neat!). I've done the back, which is just plain red/ navy st st which didn't make for any interesting photos, which is which is why I've not blogged about it before. Now I'm on the colour-work. The yarn is lovely, and the pattern's ok but I'm never the biggest fan of intarsia. Especially as said-flatmate has taken my bobbins to Italy with her for a month, so I'm doing my best with small centre-pull balls. That patten book was hiding quite a mess. But this is going slowly for reasons other than messy colour-work. I've got a huge deadline at the moment and my only knitting-time is on the bus to and from libraries. Intarsia on buses = silly, so I've got the second dna illusion sock on the go. If I manage to finish the document I'm working on, I'll be going to Fruitstock on Sunday - see you in the HipKnits section. 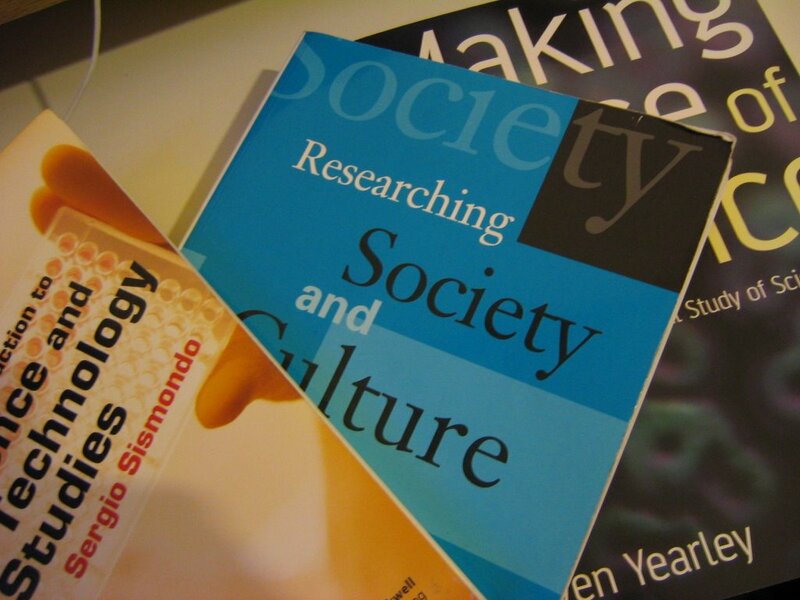 Till then, the content of these books are the only strands I'll be working on untangling. The initials "SSK" denote two things to me. 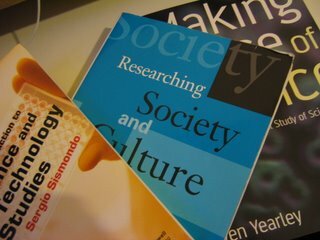 "Slip, slip, knit" and "Sociology of Scientific Knowledge", its the latter I'm preoccupied with at present. I was giving a presentation on the internet as an education tool today, and when I'd finished one of my colleagues calmly expressed the view that blogs were all just about gossip. Bah humbug. But, to prove his point... have you seen this (new anti-craft!) and this (short needles for communting!) and this (a friend made a LJ syndication feed for this blog)? Ooo, and did you hear about this (very exciting, new British yarn magazine, aiming at the more Interweave market than Simply Knitting)? I've finished my top secret piece. All that remains is a single stray end to weave in. I'd blocked it and everything before that end decided to show itself. It had been annoyingly hiding up until then. As I said before, bah humbug. 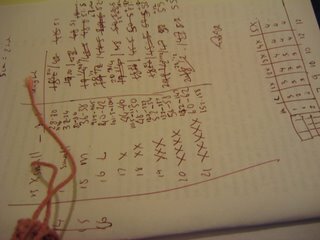 Evidence of this bleeding end, and the notes for the maths I have to do to work out the larger sizes, is all you're getting for now. EDIT: the fourth link up there (to rumours of new British yarn magazine) is less of a secret, go have a look here.